You know how Mexico is all about tacos? You also know I hate stereotypes, right? So tacos can’t be reduced to a few preparations or ingredients – they’re a universe of their own. In the category of meat tacos, specifically the traditional ones in Mexico city, Los Primos is top of the game. They serve what for me is the best lengua (beef tongue) and suadero (flank steak) in the city. 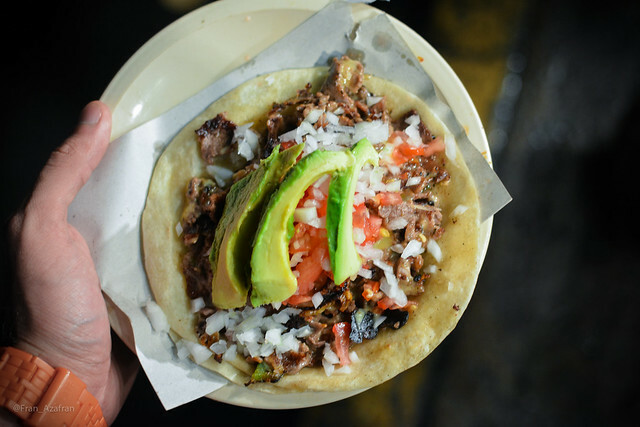 Their bistec (beef steak) taco with cheese is also a monument – served on two flour tortillas with fresh, onion, tomato and avocado. This is a late-night taco stand, so try going Thursdays through Saturdays from 7pm on. Also, there’s no address so I’m giving you the closes street address and the coordinates on the map. Look for stand on the street and the Los Primos sign.